The hostel is very good: clean and new. The kitchen is fully equipped and always clean. The hostel is very central, the main attractions are very just about 10 min walk. There's a supermarket right on the corner and full of restaurants around the area. The staff is very friendly and helpful. Rubens gave us a useful map and tips about what to visit in Chisinau and different day trips, where to take the buses. Great security with lockers and fantastic atmosphere. I'll come back from Barcelona. Lekua oso polita da eta informazio asko ematen dizute, neskak lan egiten dutenak zoragarriak dirá (eta Rubens ere). Kisinaura Joan behar duzu lehen bait lehen!!! Στο κέντρο της πόλης σ ένα ζεστό χώρο . Με τον φανταστικό οικοδεσπότη Ruben να βρίσκει λύσεις για οποιαδήποτε πρόβλημα. Το συστήνω ανεπιφύλακτα! A pesar de que llegamos antes de la hora del check-in, la recepcionista insistió en hacernos las camas para que pudiésemos descansar. Jamás había visto esto. El hostal es muy acogedor y las camas bastante cómodas. Así mismo se puede ver a Rubens, el dueño, en el hostal todos los días asegurándose de que sus clientes estén contentos. En general un muy buen hostal. I stayed only for 1 night, but it felt great to be here. The owner of the hostel is an Italian guy, very kind, helpful and welcoming. He explained me everything I had to know about Chisinau, and also arranged me a tour to Cricova Winery and its transportation, at a great price. 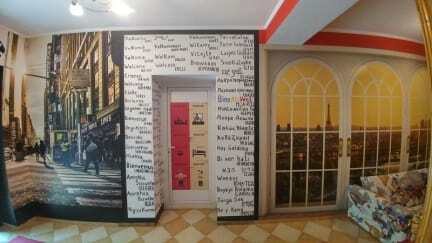 The place itself is cozy and comfortable, beds and shower were great. The location is great. 5 min walk from the central square and 10 min from a nice park with a lake and stairway. Highly recommend this place. Muy buen ambiente. Rubens es muy atento. Volvería seguro ! 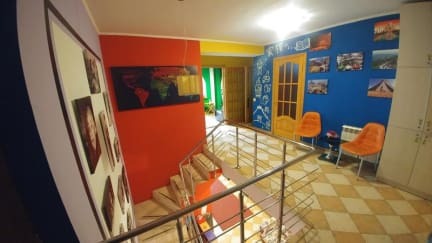 magnífico hostel si estas de paso por chisinau! el dueño italiano muy simpático y atento, se encargaba todo el tiempo de que no hiciera falta de nada, darnos indicaciones de todo lo que ver en la ciudad, así como incluso llamar a la estación para preguntar por autobuses o trenes o pedir un taxi! lo único que no entiendo es esa estúpida costumbre de tener que quitarse el calzado a la entrada! aun así sin duda se lo recomendaría a cualquiera!